I received my custom order of Pokemon cross stitches today from the lovely Grizzly Hare on Etsy! I ordered three customs of my favourite Pokemon. Ellen's customs are very reasonably priced at only £4 unframed. My order came packaged really pretty in brown paper and stamped with the Grizzly Hare shop name which is a nice touch. The first Pokemon that I ordered was Vulpix because I love her and she turned out so cute. My cross stitch literally looks identical to her sprite, it's done very precisely. This one is unframed. I also ordered Mudkip <3 and Caterpie. 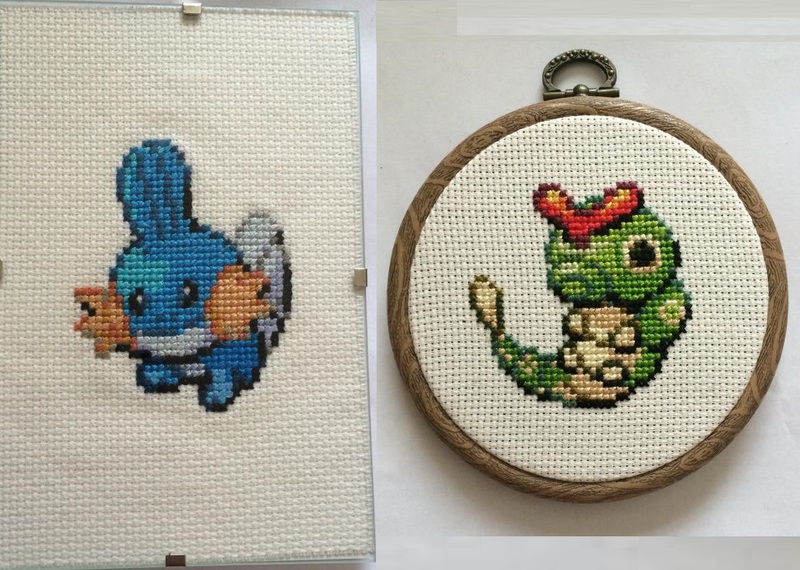 My Mudkip came framed in a glass photo frame and my Caterpie is framed in a traditional circular wood grain embroidery frame. I love the effect of the circular frame, it's really effective and it sets off my little Caterpie perfectly. I'm really pleased with both of these, they turned out exactly how I had envisioned.